It is been said that this dish was so popular in the 19th century among the officer candidates that they marched all the way to Gaisburg where their favorite dish was served in tthe Gasthof (Inn) called Bäckerschmide. Another version tells, that the locals from Gaisburg became prisoners of war and their women were only allowed to bring them one meal every day, so they created this nourishing dish and marched with it to the camp. Gaisburger Marsch is a combination of potatoes and Spaetzle in a beef broth together with "Tafelspitz", a special beef filet, and marrow bones, served in a soup bowl with roasted onions on the top. Happy Cooking! - Cut the vegetable roughly. Peel 1 onion, cut in half and stick the cloves into it. - Let cook on low heat for 90 minutes. Add salt to taste when the soup is cooking. - Peel potatoes, cut in cubes. - When the meat is done, put it on a plate and drain the broth. Keep the broth and boil in the same pan the potatoes. - Cook the Spaetzle or make them (see the recipe on this blog), per instructions, drain them in a sieve. 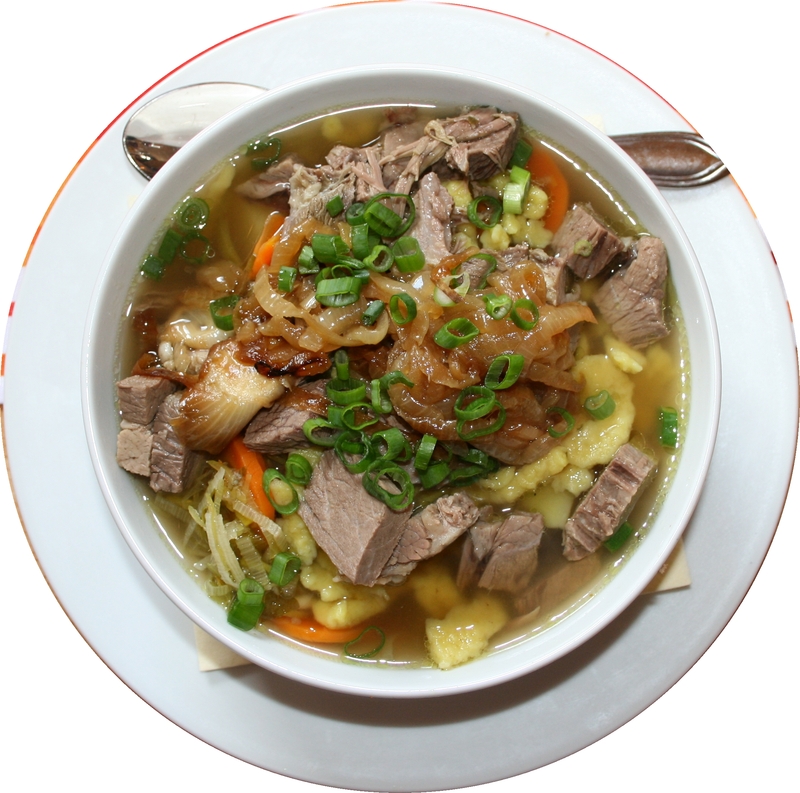 - Cut the meat into cubes, add it with the Spaetzle to the potatoes in the broth, spice it with nutmeg. - Cut the other onion in cubes and saute them in the butter until golden. Serve the soup in a big soup bowl, and on each portion sprinkle the onions and the chopped parsley. Could you send me the link to the poem? Thanks.